Founded by Alexander the Great over 2,300 years ago, Alexandria has belonged both to the Mediterranean and to Egypt, a luxuriant out-planting of Europe on the coast of Africa, but also a city of the East--the fabled cosmopolitan town that fascinated travelers, writers, and poets in the nineteenth and twentieth centuries, where French and Arabic, Italian and Greek were spoken in the cafés and on the streets. 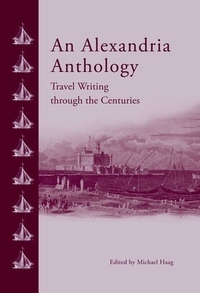 In the pages of An Alexandria Anthology, we follow the delight of travelers discovering the strangeness of the city and its variety and pleasures. Most of all they are haunted by the city's resplendent past--the famous Library, the temple built by Cleopatra for Antony, the great Pharos lighthouse, one of the seven wonders of the world, of which only traces remain--we follow our travelers here too as they voyage through an immense ghost city of the imagination. About the series: The elegant, pocket-sized volumes in the AUC Press Anthology series feature the writings and observations of travel writers and diarists through the centuries. Vivid and evocative travelers' accounts of some of the world's great cities and regions are enhanced by the exquisite vintage design in small hardback format that make the books ideal gift books as well as perfect travel companions. Designed on cream paper stock and beautifully illustrated with line drawings and archival photographs.